In my previous discussion of the disasters of the nuclear age, there was one that I probably should have mentioned. To be honest, I had never heard of it. That itself speaks volumes about the influence of certain mindsets on the nuclear debate. The incident I’m talking about came to be known as the ‘Castle Bravo’ incident, and it remains the worst example of US caused nuclear contamination ever. 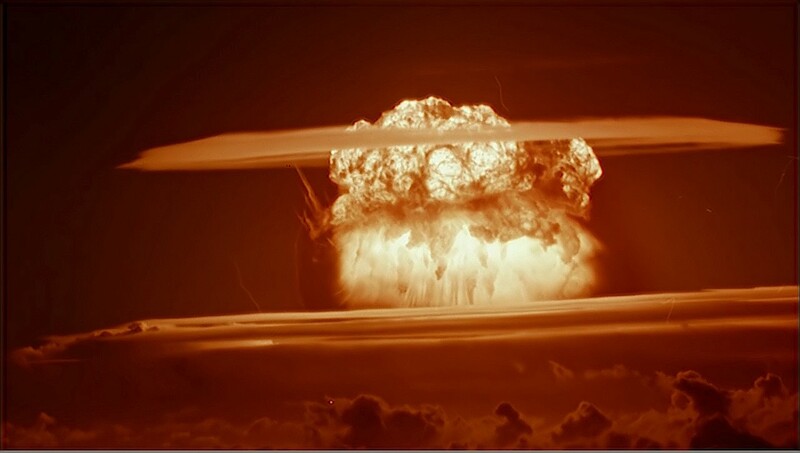 You may never have heard of Castle Bravo, but you probably heard of its flow on effects. Ever heard of Godzilla? Early in the morning of March 1, 1954, the USA detonated the most powerful weapon it has yet detonated. The ‘Bravo’ test of Operation Castle, this bomb was designed to study the efficacy of ‘dry fuel’ fusion nuclear weapons (hydrogen bombs). Originally planned to be around 5 megatons in power, the actual blast was on the order of 15 megatons. The Castle Bravo explosion from 30 miles away. Los Alamos National Laboratory. This highlights some of the problems in the scientific culture at the time (and to a lesser extent, today), as the scientists involved were completely sure that what they had planned would happen. A vast miscalculation about the behaviour of the fuel resulted in the enormous blast, but this miscalculation had further effects as the safety protocols developed for the test underestimated the strength of the explosion. In the ensuing chaos, many military personnel were exposed to high levels of radioactive fallout. In addition to the size of the explosion, there was also a meteorological miscalculation, that resulted in the fallout cloud drifting towards the Marshall Islands, instead of away from them. The populations of the effected islands are still unable to return. A Japanese fishing vessel was also hit hard, with one man dying, which caused a significant political issue with the US. Because they messed it up so much, the US government was forced to go public about the test, in one moment revealing the extent of their nuclear research to the USSR, but also revealing to the world the terrifying strength of nuclear weapons (especially the effects of radiation and fallout). The Castle Bravo test is said by some to be the first incident to spark ‘radiophobia‘ around the world, with the dangers being made visible through the suffering of the Japanese and Pacific Islander bystanders and the members of the military who were inadvertently exposed. In terms of the nuclear power debate, as I said in my previous post, these events have the power to impact the public in a way that cannot simply be undone by presenting facts. Too often, such as in the case of the Chernobyl or Sellafield, the public (or the government) is assured of the safety of a particular scenario, and it is only after problems have developed that the scientists critically evaluate their work (if ever). To combat radiophobia and the negative impacts of these sort of events, much more needs to be done than just reiterating facts at people. This entry was posted in Uncategorized and tagged above ground testing, atomic, bomb, Castle Bravo, debate, disaster, environment, impact, mistake, scientific hubris, testing. Bookmark the permalink. Silent spring, Castle Bravo and modern environmentalism. Change in the air for Australia? Fusion power: will it be tainted by the history of nuclear fission? Is the nuclear debate a moot point?